My mother made a delicious apple pie. Actually, she made a great lemon meringue pie, chocolate cream pie and banana cream pie. She was good at dessert. And she always made her pie crusts from scratch. You’d never find a ready-to-use pastry in her refrigerator. Never, ever. Not that there’s anything wrong with store-bought pie crusts – they make perfectly delicious pies and are wonderful timesavers. I’ve used them countless times. My mother simply enjoyed the process of making her own pastry dough and, after many years and hundreds of pies, she was quite good at it. But despite clever catch phrases to the contrary, pie is not always easy. It seems more important now that my mother is gone, that I perfect the delicate skill of flaky pastry dough. Like carrying on a family trait, I know it was something she loved to do and something she felt was very important. “Everyone should know how to make a good pie crust,” I can imagine my early 1960s mom saying to me and my sister as we watched her expert moves in the kitchen. Reaching back in my memory vault, my mind’s eye looks for photos of her at the worn bread board, wooden rolling pin in hand, and tied at her waist is a homemade kelly-green apron with two big pockets to catch a stray raisin rolling off the counter. With her black, patent-leather flats, skinny, red capri pants, and crisp, white blouse, she looks a little bit like a Norman Rockwell Christmas card. She is methodically rolling out the pie dough, her fingers white from a flour dusting, a smile emerging from her pursed lips as she rolls and forms the dough ball into one flat, perfectly rounded, soon-to-be flaky pastry. At this point, the pie filling is not important. This moment belongs to the foundation of a great pie: the crust. Pie crust from scratch is not a long process – quite the opposite. In fact, if you overmix a pastry dough, you’re doing it wrong and you will be sorry. Overmixing will likely result in a tough (read: non-flaky) dough — a discouraging moment that doesn’t reveal itself until the final result, as a forkful of pastry meets your piehole. Once I started experimenting with pastry dough made from scratch, it became an intriguing new hobby. Unlike other baking formulas, pie crust is so much more than simply combining ingredients in specified amounts, as the process is somewhat of an artistic expression. My pastry skills are still a work in progress, as not every pie crust I make from scratch turns out Food Network-worthy. Hardly. But practice makes perfect, right? And, for me, that’s the fun part. A few days ago, it was uncharacteristically overcast for a spring day in this part of the country. According to the calendar, the sun should have been out in all her glory, but she hid most of the day behind roaming, graying clouds that let go of occasional light rain showers throughout the afternoon. It was the perfect opportunity to throw open the french doors off the kitchen and allow the chorus of the birds in my backyard and the raindrops on the deck to choreograph a baking session. An empty, quiet house offers the perfect opportunity for me to let go of any number of daily worrisome thoughts that are stuck in my brain like sticky notes on a bulletin board. It is a pleasure to focus all my attention on an evolving cream pie filling simmering in a heavy-bottomed pot on the stove, while a pie crust already baked to a golden brown stands at the ready; or to squeeze fresh lemon juice over crisp, tart apple slices piled high in a glass bowl as they await their shower of cinnamon and sugar, while a ball of pastry dough chills itself to perfection in the refrigerator nearby. 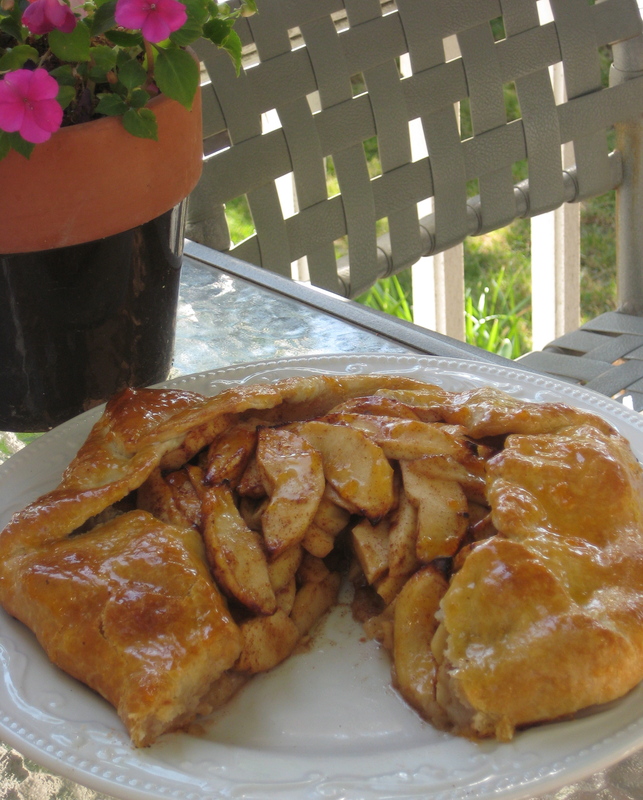 So when the shiny, lime green Granny Smith apples recently called to me from across the produce aisle at the grocery store so loudly that I couldn’t ignore them, I thought about how fabulous they would look — and taste — tucked inside an apple tart. With a large circle of pastry dough that snugly overlaps itself around sweetly seasoned apple slices, leaving the top of the pile exposed to the elements, the rustic apple tart is not your mother’s apple pie. It’s unique, impressive, and easier than it looks. And if apples aren’t your preference, assemble the tart using fresh or frozen peaches instead, or perhaps a medley of juicy berries. And just like that it’s as if Summer cut in line in front of Spring! This recipe is easy to make and you don’t even need an heirloom pie plate or great design skills — just a cookie sheet and some parchment paper. It is perfect for a special, intimate dinner party. Don’t skip the last step with the apricot preserves – it’s what gives this dessert its WOW factor. Adjust the cinnamon and allspice to suit your tastes, or add ground nutmeg or cloves. Served warm or at room temperature and topped with a small scoop of french vanilla ice cream or shavings of a natural, sharp cheddar cheese, it is a special treat. 1. 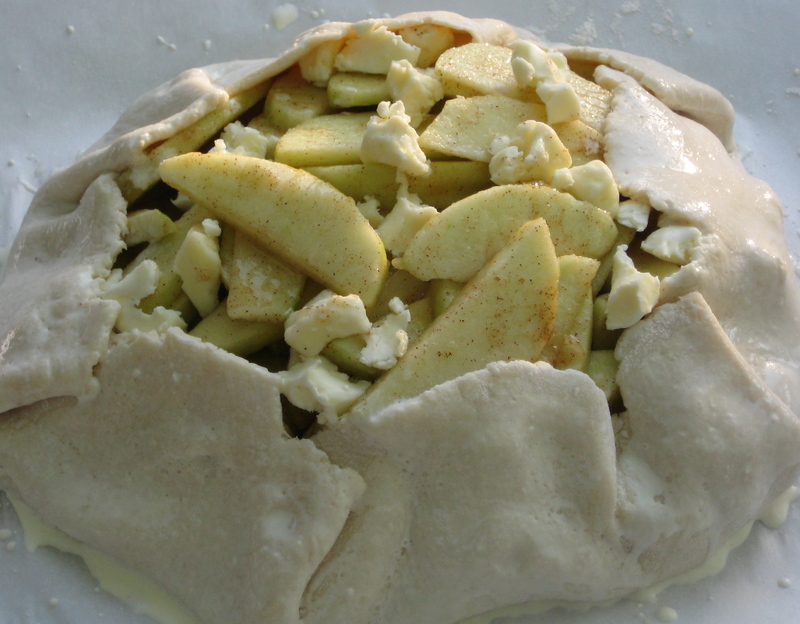 Prepare the tart filling: Place apple slices into a large bowl; sprinkle with the sugar, cinnamon, allspice, flour and salt. Add the lemon juice and stir together until all apple slices are evenly coated with the sugar and cinnamon. Set aside to allow the flavors to get acquainted. 3. Pour prepared apple slices out onto your prepared pie crust round, leaving at least a two-inch border all the way around. (It will look as if there are too many apple slices for the size of the crust, but just pile them up high; the apples will shrink during baking.) Carefully fold up the exposed crust border over the apple slices, overlapping each section as you make your way around the circle. There will not be enough crust to cover the apple slices completely — that’s OK, it’s supposed to be that way. 4. Place butter pieces in and around the exposed apple slices; lightly brush the outside crust with the cream and bake at 350 degrees for about 45 minutes to 55 minutes (depending on your oven), or until crust is nicely browned and apple mixture is bubbling hot. Remove from oven, let cool for 5 minutes, then lightly brush outside of crust with apricot preserves to create a tantalizing sheen. Let cool another 15 minutes. Serve warm or at room temperature. Place flour, sugar, and salt into a food processor and pulse for a couple of seconds to combine. Add the butter and pulse until the mixture is a course crumbly texture, like sand, being careful not to overmix. With the food processor running, slowly add the water just until the mixture starts to form a ball of dough. (You might not need the full 1/4 cup of water.) Turn out onto a floured surface and pat into a thick disk shape. Wrap in plastic and refrigerate for at least one hour. When completely chilled, remove from plastic wrap and place onto a lightly floured surface. Using a floured rolling pin, and rotating the dough every so often, roll pastry into a large round circle and place on a large cookie sheet that has been lined with parchment paper. It is now ready for a prepared filling mixture. 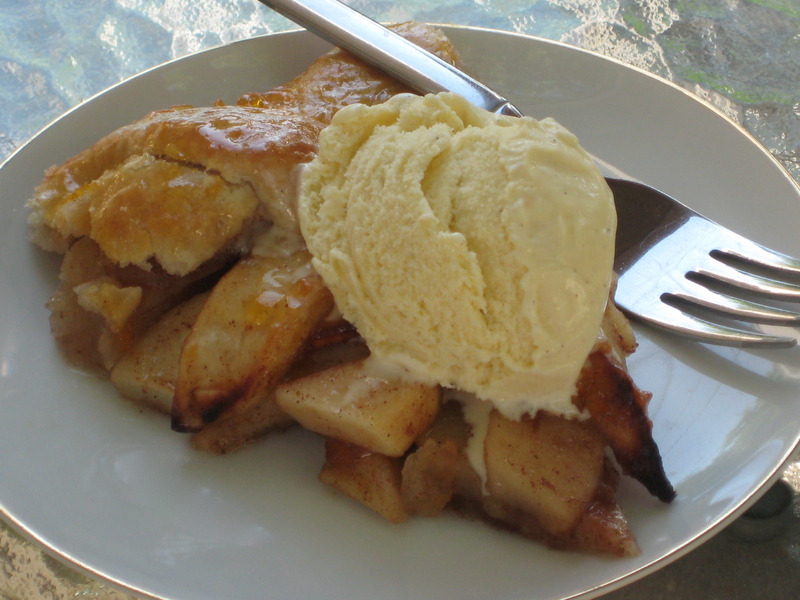 This entry was posted in Desserts and tagged apples, dessert, ice cream topping, pie, tart. Bookmark the permalink. I have made this a couple times and it was fantastic!!! I couldn’t believe how easy it was. Everyone was so impressed that I made it from scratch I did add a little extra cornstarch because I thought the juice would make the bottom crust a little soggy for my taste. Perfect!!! So glad you enjoyed the apple tart! Good idea about the cornstarch — I hate a soggy bottom! Excuuuuuuse me! I believe that Bryan and I are the documented biggest fans of your PB cookies! You send me off in my car with a bag of a dozen or so…….maybe 6 will actually make it into the house. Good times! Bless you, Suzanne! I’ve always loved that you love my cookies! And you’re right, you were enjoying them long before my niece came along! Is there a facebook share button anywhere on this page? Yes, Jonathan, at the bottom of the post, to the right of the SHARE tab, press the MORE tab and it should bring up the Facebook button. Thanks for stopping by! Wow that was unusual. I just wrote a very long comment but after I clicked submit my comment didn’t show up. Grrrr… well I’m not writing all that over again. Anyways, just wanted to say excellent blog! Thanks so much, Jeniffer! Sorry you had trouble with your comment, but all comments are first reviewed by me before they are published. It must have fallen through a crack somewhere. Hope you stop by again. Mm. Looks delicious! We have a ton of apples on our trees this year so we’ve been having lots of apple pies, apple sauce and apple butter. Have you ever tried xanthan gum or guar gum for keeping the crust from being too crumbly? We add that to our gluten-free (which is VERY crumbly normally) recipes. I want apple pie now. First off I want to say wonderful blog! I had a quick question which I’d like to ask if you do not mind. I was interested to know how you center yourself and clear your mind prior to writing. I’ve had trouble clearing my thoughts in getting my ideas out there. I do take pleasure in writing but it just seems like the first 10 to 15 minutes are generally wasted just trying to figure out how to begin. Any suggestions or hints? Many thanks! I know the feeling; I also have trouble from time to time. What I usually do is start by jotting down my thoughts, absolutely any and all of them. Don’t think about structure or outline at that point; your main focus is in getting your thoughts and ideas down on paper (or computer screen). Relax; organization (editing, adding or deleting) will naturally follow. Good luck!